As you probably guessed from my last post, the most interesting part of this story is the mother. My heart goes out to her. To me, she represents the feminine Divine, The Mother of All, She-Who –Hears the Cries of the World. She is Wisdom, present at the dawn of creation waiting with that same half-smile to see if her god will choose to create light. She is the Great Mother, oldest of the old, the beginning of all things. She is Eve, genetic mother of humankind. The stories simply don’t work without her. 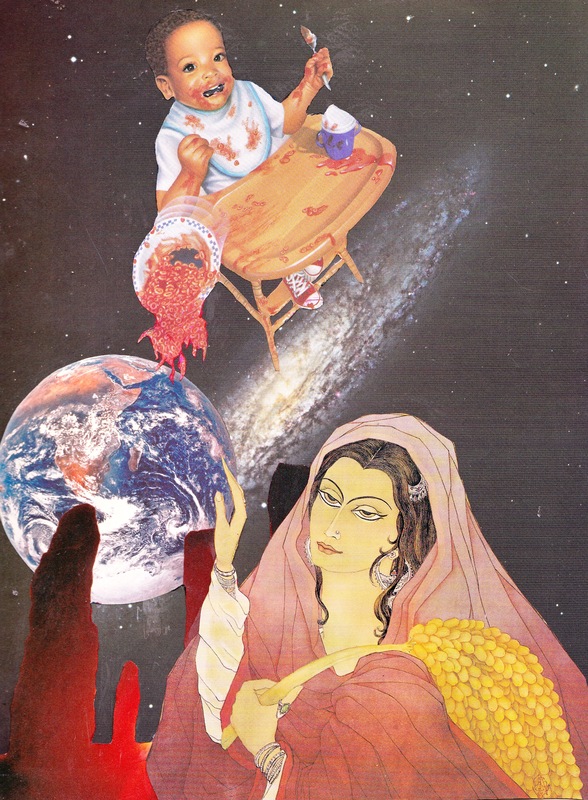 Krishna, Buddha, Christ, Dionysus all had mothers integral to their stories. The mother in this collage is fruitful, you can tell by the dates she carries. She loves the Earth. She is the Earth. Whatever else may happen in the cosmos, Gaia is home to us. If you read the history of Mary in the Catholic Church you will find she wasn’t wanted by the establishment, but there was no way to keep her out. The Church may have wanted to excise the feminine, but the people would and could not do without it. They knew in their bones and muscles and guts; in the primal material of their bodies that there is no life, no spirituality, no joy without the inclusion of both masculine and feminine energies. Both inspire awe; both nurture the psyche and sustain the spirit. Without both, we wither and cannot be fruitful. One might say a mother is defined by the children she bears, but I say motherhood lies in the quality of the love she brings to bear on the world. After all, it is the nature of children to grow up and away, to separate from their mothers. The mother, enhanced, enriched, empowered by the experience goes on to pour out her wisdom to those whose path she crosses. She is the mother bear who walks away one day while the yearlings play, the mother cow who turns her back on the weaned calf. The separation works both ways. During pregnancy the gravid mother has months to turn inward, to contemplate, and reflect. Settle and come to terms with a new way of life. When her children leave, she goes through the same process, never forgetting them or ceasing to love, but returning to her own concerns. Krishna may be a god, may carry the universe inside him and weaken her knees with love, devotion and adoration. Nevertheless, he is not hers, not her and in the end he may fly through space, doing his god thing while she ponders what she ponders and dreams what she dreams.